This paper was originally written for delivery on January 8, 2010, at the American Historical Association Annual Meeting in San Diego, California, as part of the panel “Identity Documentation and the Modern Western State.” Because it is part of a larger work in progress, please do not quote or cite it in a print-published work without emailing me (Shane Landrum, srl AT cliotropic DOT org) to find out whether an updated version has been published. I’m circulating this paper online in hopes of receiving a wider range of comments on my work and of reaching a broader audience. If you have questions or comments, feel free to comment below or to email me separately. I’ll try to respond to comments promptly, but as of mid-January 2010, I’m very busy finishing my dissertation and replies may be slow. “Undocumented Citizens: The Crisis of U.S. Birth Certificates, 1940-1945″ is Copyright © 2010 by Shane Landrum and is licensed under a Creative Commons Attribution-Noncommercial-No Derivative Works 3.0 United States License. This research was funded partially by the Institute for Political History’s Hugh Davis Graham Fund, the Alfred J. Beveridge Fund of the American Historical Association, the Herbert Hoover Presidential Library Association, the Gilder Lehrman Institute for American History, and a Crown Family Fellowship from Brandeis University. My thanks to all of them for their support. Notes on formatting: I’ve reproduced my footnotes here as a guide for other researchers. However, due to format-conversion issues, some text which was originally italicized is not italicized here. The original talk featured slides which, due to uncertainties about copyright, I haven’t reproduced in this version. US law had specified for over a decade that aircraft companies must only hire citizens, but the wartime boom made this requirement relevant for many more workers.3 Despite the importance of being able to prove one’s citizenship with a birth certificate, in the early 1940s, about 43 million Americans—nearly one-third of working-age population—had no such document. Their births had never been recorded by government, and they faced complex and unfamiliar procedures for documenting their own births. This process was known as “delayed birth registration;” people sent forms and supporting evidence to the offices of vital statistics in their birth states, then waited for weeks or months to get an answer. The problems these people faced were results of the relatively slow development of government identity bureaucracies in the United States. The US wasn’t like European countries, many of which had developed internal passports and other identity documentation systems in the 19th century or earlier. The United States may have been the first country to have a constitutionally-mandated national census, but that census only happened every 10 years and wasn’t used as a means of identifying particular citizens. Rather, American documentary identity systems-— like the vital-records bureaucracies which issued birth certificates-— were decentralized and locally run.8 Dual-federalist systems for identity documentation resulted in state offices that were unprepared to cope with their roles as citizenship documenting agencies. In the case of delayed birth registration, the diversity of state-level policies and procedures had profound implications for native-born Americans’ ability to prove their identity and citizenship. This paper’s drawn from my dissertation on the history of birth certificates and compulsory birth registration in America. In the larger work, I discuss how Americans developed modern systems for compulsory birth registration, how ordinary people learned about the uses of birth certificates, and how birth certificates changed American law. First, I’ll talk more about the scale of the birth certificate crisis and how unprepared state governments were to act as identity bureaucracies. Secondly, I’ll talk about California’s judicial procedure for delayed birth registration. Finally, I’ll discuss Virginia’s racial registration policies, and I’ll show how the postwar federal welfare state hinged on the use of birth certificates as identity documents. 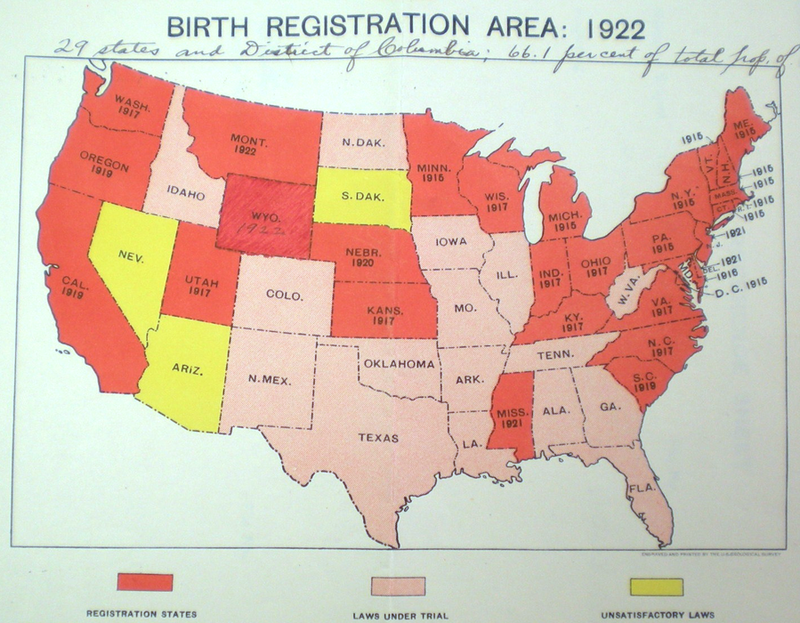 US Birth Registration Area, 1922. Registration-area states (at least 90% of each year's births registered) are in red; states with "laws under trial" are in pink; states with "unsatisfactory laws" are in yellow. In 1942, the birth certificate crisis became less urgent, as the War Manpower Commission announced that defense-plant workers no longer needed to show a birth certificate as proof of their citizenship. Instead, they could swear to their citizenship “in the presence of an Army or Navy plant representative,” signing their names and agreeing to a $10,000 fine and up to 5 years in prison if they were lying.29As a result of the new policy, citizen requests for delayed birth certificates slowed significantly, though never again falling to their prewar levels. In Virginia, state-specific policies on delayed birth registration had a dramatic effect for people with ancestors of color. There, the only law for delayed birth registration was the 1927 “Act to Preserve Racial Integrity,” which required anyone born before 1912 to register his or her race as “white” or “colored.” The state’s racial categories were supported by an elaborate system of government genealogical recordkeeping.30 32-year-old William E. Bradby, like many other Virginia-born people, moved to Detroit in search of defense-industry work, then wrote to Richmond for a delayed birth certificate. He filled out the state’s standard form, entering his birthdate, birthplace, and his parents’ names, John and Lizelia Bradby, whose race he described as “half-breed Indian.” When he received a reply, it contained no birth certificate, only a typewritten letter from state registrar of vital statistics Walter Plecker telling him that he had completed the form incorrectly. This letter was almost identical to dozens of others Plecker sent during the early 1940s.32 William Bradby was a Pamunkey Indian, born on his people’s traditional land in the Tidewater region, but he had to choose between living without a birth certificate or being classified as “colored” on his fundamental document of citizenship. One self-identified “Indian” returned his children’s birth certificates to the state in protest rather than tolerating Plecker’s disrespect.33 Lacking effective ways to exert sovereignty or to create their own legally-binding birth records, the Pamunkeys and other Virginians of indigenous descent were vulnerable to the state’s attempts to document them out of existence.34 Birth certificates could enable individuals to prove their citizenship, but they were simultaneously powerful tools for government control over the categories of identity. The wartime birth certificate crisis brought new attention to the idea that every American needed a birth certificate. Federal military bureaucracies required soldiers’ wives to present a marriage license and their children’s birth certificates in order to receive the health services accorded to military dependents. Thus, birth certificates became tools of social citizenship for the children of the Baby Boom.35 Some public schools had long required birth certificates of pupils who were registering for kindergarten or first grade; these requirements became almost ubiquitous in the postwar period.36 The Fair Labor Standards Act of 1938 required young workers to prove their ages-—ideally with a birth certificate—before joining the paid labor market. Increasingly, thinking about birth certificates became a mother’s job, part of how she secured her children’s birthright as citizens.37 As the nation’s economy boomed and the GI Bill helped solidify a growing middle class, American suburbs filled with fathers, mothers, and children whose births were registered and who increasingly relied on government as the proper recordkeeper for every individual’s birth. Because of these uses of birth certificates, citizens were able to push back somewhat against arbitrary state policies like Virginia’s. In the late 1940s, just a week before Virginia registrar Walter Plecker retired, he was contacted by a lawyer on behalf of a 29-year-old military wife who needed birth certificates to secure Veterans Administration benefits for her two children. Plecker and his office staff had held her request for certified copies because they were busy researching whether she was a descendant of a mixed-race man and “his white housekeeper.”38 We can know about her successful challenge because she hired a lawyer, but Walter Plecker’s preserved correspondence holds many more examples of Virginians who were forced to submit to racial classification in order to secure their basic document of birthright citizenship. Thus, the expectation that Americans should have and be able to use a birth certificate was a generational phenomenon. It was rooted in the specific wartime experiences of American adults during World War II and in the policies of the postwar social welfare state. Although many Americans of the wartime generation had grown up with government birth records and had used birth certificates to prove their ages and identities, the unevenness of federal and state-level power had ensured that some of their peers could reach adulthood without one. By the late 1940s, birth certificates had become documents that few Americans could afford not to have. Nicely done. The Virginia stuff is very striking — I’d say shocking, but I know too much to be shocked by this sort of thing anymore — especially the resistance which it engendered. Thanks for posting it, and I look forward hearing more in the future. A very informative work. It would appear that J. Edgar Hoover was not alone in discovering in middle age that his birth had not been registered at the time! I am emailing on behalf of my very ill 66 year old sister. We have recently surprised her with a cruise…unbeknown to us she never had a birth certificate..seems that all these years she just has a certificate from the hospital she was born in. Unfortunately, all our family members are deceased…we have tried bureau of vital statistics (which replied “no birth record found”). My sister lives alone and is below poverty level in Hudson County, NY. She was born to Margaret Giardina and (we thought) Joseph Emanuel Giardina. Her birth place was Jefferson County, Missouri. Joseph Giardina is deceased and Margaret Giardina does not remember (she is 87). My sister Evelyn Lee Giardina was born on July 7, 1945 and Joseph Giardina was in the service at the time based in St. Louis, Missouri. I have been trying to help my sister and have exahusted all avenues…can anyone help her? Now, of course it is not about a cruise…My sister is becoming worse on a daily basis and I was thinking could her birth record be part of “Undocumented Citizens”? Mary, I haven’t found any record of your sister in my research; Missouri isn’t one of the states I study closely, and she was born too late for me to have seen any records by any of your relatives in the archival material I use. What I can say generally is that vital-records offices were very busy during 1945, and it wasn’t uncommon for a child’s birth not to get recorded by state offices. You may still be able to file for a delayed birth registration through the Missouri state vital records office. Their policies will most likely require you to document your sister’s birth using the hospital records you have, plus the oldest other records you can find. (I’d start by contacting the hospital where she was born and asking them for a legally-certified copy of their records about her birth.) Other documents which may be handy in supporting your application would include infant-baptism records and school records from as early as possible in her life; any other legal records which state her birthday and/or place of birth may also be useful. In all cases, you’ll probably need legally-certified copies if they’re available. Once you’re able to get a birth certificate for your sister, getting a passport for her should be a matter of paperwork. The Passport Office has the ability to expedite this process for a fee. Given the situation’s time-sensitivity, you might also try contacting your US Senator to see if their office can help you speed things along. Best of luck. I fall into this place of not being able to find birth proof – I found my fathers Michigan 1920 birth certificate that just states baby Lillie as his name but not mine and now that I’m sixty five I’m unable to complete my forms to get Medicare…..is there some solution if my birth certificate doesn’t exist? No one in my family is alive any more so I can’t get any information from them. It is interesting to know problems exist during 1940-45 concernig Birth Certificates. I have two copies of my Birth Certificates, one with the year 1940 and the other 1941. Howevr, since my school records claim the year 1940, I use this date. Many documents were lost, and my granparents who were born in the 1800′s would write their family names in the Bible, and many times leaving off the year of birth. With the help of the American Historiacal Association and the Geneology Foundation, important information has surface. My aunt was born in Virginia, August 6, 1945. She has never had a birth certificate, which has hindered her desire to travel outside of the country. If you think you can help me, or can give me direction to help get her birth certificate, please contact me at aberman@optimusbuilders.com. I’m not sure what town she was born in, but my grandfather was working in the shipyards at the time, from what I’ve been told. My husband was born in 1938 in North Carolina. He was born at home aided by a midwife. He needs a birth certificate but there isn’t one at the county courthouse, nor is there one in the NC Vital Stats. dept. Needless to say all the relatives are now deceased. He wasn’t in the military nor does he have a passport. He doesn’t have a family Bible or a baptismanl certificate. He is listed in the NC 1940 census at age 2. What do we do now? ?